Meet Logan Tibbets. 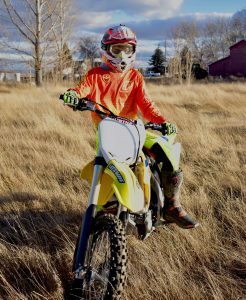 He’s an 18-year-old student here at iSucceed who loves motocross racing. In fact, he’s practically grown up on a dirt bike. By 16, Logan started racing competitively. With competitive motocross racing comes a hectic schedule. Logan is gone most Fridays to practice on the tracks. After a while, the demanding schedule made it difficult to stay in a traditional school. Logan now works ahead to complete his 10 lessons a week before Fridays, so he can enjoy the long weekend of racing. One thing you’d probably never guess about Logan: He’s also a competitive bowler. After graduation, Logan is not quite sure what want to do. But one thing’s for sure, he plans to continue racing. “I hope to continue racing and see where that takes me,” said Logan. And we can’t wait to see where it takes him. Share your positive thoughts with Logan in the comments below!